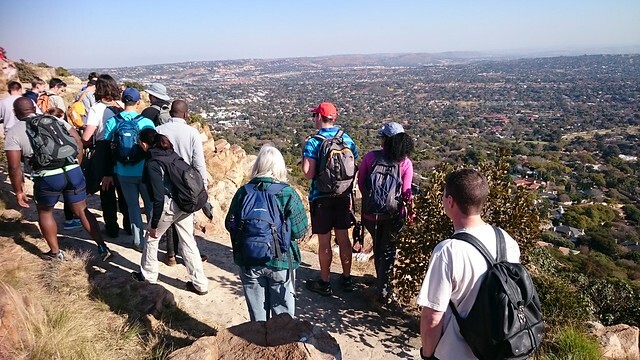 I’ve been intending to climb at Northcliff Ridge with the MCSA JHB Chapter since 2013 but never had a chance as the club meet at this location previously took place during Ramadan when I am fasting. Fortunately, I managed to climb there today, less than a week after Ramadan 2016 concluded. I ask myself why didn’t I visit this location before. I’ve driven within 5 minutes of it hundreds of times and the place is tops! Literally at the top of Johannesburg! 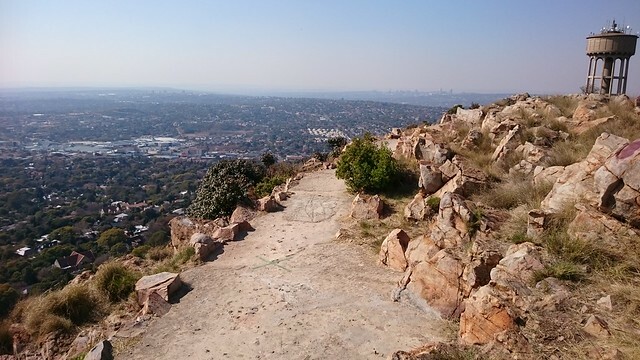 The park at the top of this cliff offers panoramic views of the northern suburbs of Johannesburg. You can see Hillbrow, Sandton City, Cresta Shopping Center, the Honeydew water tower, The Northgate Dome and Magaliesburg mountains easily. This place looks like it’s quite a popular destination for tourists as I heard a few people in the park speaking French and German. It’s also popular among the youth who I’m assuming are from the area. I saw one group of youngsters smoking weed and another group drinking alcohol. Unfortunately there are a few broken bottles, cigarette butts and a bit of trash thrown in the area. Commercial-minded-me thinks it would be a cool place to have a coffee shop. The place is also a popular spot for people to fly their model aircraft. It’s wise to let the controller know where you’re climbing so that they can avoid that section (for your safety). Also make sure that you keep your belongings with you when in the park. There’s a high risk of theft. There’s quite a few climbing routes on various sides of the park. This SACIN page provides an overview of the routes and grades. We climbed on the north-facing ridge which is always facing the sun (which means it gets hot). 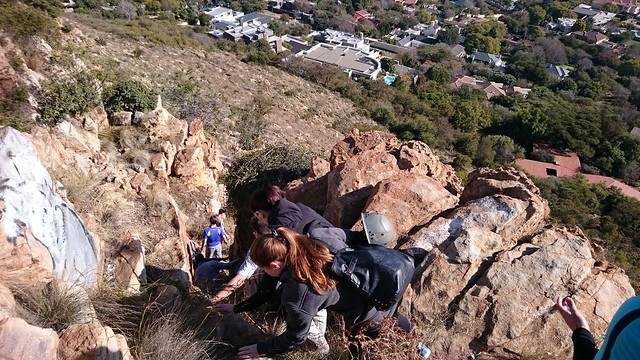 It’s quite a steep scramble to get to the climbing area. One of the model aircraft controllers advised us not to scramble down the first route that we intended as he said that it was the steepest also the same route that the 20yr old climber fell to her death in January 2015. We chose another safer route (still steep though) about 30 meters away. This zone is primarily a top-rope climbing area. The quartzite rock face is smooth and can be a little slippery (especially in the shaded areas in winter) so bring chalk. The view of Johannesburg from this location is awesome. Click to see my 360 photo. Since this was an MCSA Orientation meet where there were a number of first time climbers, members were there providing instruction and great tips. After some climbing I chose to watch some of the pros doing routes that I can’t currently imagine completing myself. All in all it was a good day in a good climbing location, very close to home. Looking forward to returning. Took the “digital nomad” plunge, so far so good. The most alive I’ve been. Met amazing and very interesting people.